The Ron Paul campaign has generated a lot of excitement, especially among young people. It has made political history by raising more money in a single day than any other presidential campaign, ever. It has inspired thousands and given hope to those who had given up on politics altogether  as well as thrilling longtime libertarians who have been laboring in the vineyards all these years and haven’t seen anything like this before. On the other hand, it has inspired  if that’s the right word  a counter-movement, an anti-Paul coalition that extends from the extreme Left to the neoconish Right, and all points in between. What’s interesting is that the lies told by these anti-Paulistas amount to pretty much the same tiresome mantra, no matter what the politics of the perpetrator, and it amounts to this: Paul is a secret neo-Nazi. "I have kept quiet about the Ron Paul campaign for a while, because I didn’t see any need to say anything that would cause any trouble. However, reading the latest release from his campaign spokesman, I am compelled to tell the truth about Ron Paul’s extensive involvement in white nationalism. "Both Congressman Paul and his aides regularly meet with members of the Stormfront set, American Renaissance, the Institute for Historic [sic] Review, and others at the Tara Thai restaurant in Arlington, Virginia, usually on Wednesdays. This is part of a dinner that was originally organized by Pat Buchanan, Sam Francis and Joe Sobran, and has since been mostly taken over by the Council of Conservative Citizens. "I have attended these dinners, seen Paul and his aides there, and been invited to his offices in Washington to discuss policy. "For his spokesman to call white racialism a ‘small ideology’ and claim white activists are ‘wasting their money’ trying to influence Paul is ridiculous. Paul is a white nationalist of the Stormfront type who has always kept his racial views and his views about world Judaism quiet because of his political position. "I don’t know that it is necessarily good for Paul to ‘expose’ this. However, he really is someone with extensive ties to white nationalism and for him to deny that in the belief he will be more respectable by denying it is outrageous  and I hate seeing people in the press who denounce racialism merely because they think it is not fashionable. "Bill White, Commander, American National Socialist Workers Party"
To begin with, who the heck is Bill White? Here’s what the Anti-Defamation League of B’nai B’rith has to say about him: "Along with his media savvy," they aver, "White is known for spreading propaganda and lies about his perceived enemies." Go here for his extensive criminal record. White started his career as a dingbat of renown with the founding of the Utopian Anarchist Party when he was just a lad. The UAP’s 15 minutes of fame occurred after the Columbine High School shootings, when White or one of his wacked-out confreres issued a statement praising the shooters. This guy loooooves attention, and he got plenty of it when, after his evolution into a Sieg-Heiling, uniform-wearing neo-Nazi, he published the addresses and home phone numbers of the Jena Six. His "career" as a major nut reached its zenith with his leadership in the National Socialist Movement, which at one time claimed to be the biggest collection of losers and criminal misfits since George Lincoln Rockwell and his gang first blighted this country with their presence. But that outfit blew apart, mostly on account of White’s penchant for factional manipulation, and this effort to derail the Paul campaign is this would-be mini-Hitler’s latest claim to fame. If Bill White ever came to the meetings, he didn’t use his real name  he doesn’t even get the name of the restaurant correctly." There’s nothing worse than a sloppy smear, but then again, Paul’s enemies aren’t too particular about the quality of the slime they sling at him. Charles Johnson, the anti-Arab fanatic who runs the Little Green Footballs Web site, has absolutely no compunctions about teaming up with a neo-Nazi goofball like White if it serves the purpose of discrediting Paul. Yet by acting as a megaphone for a crazy person, Johnson only winds up discrediting himself. Oddly, it turns out that Johnson the ardent Zionist and White the goose-steppin’ Nazi have an awful lot in common: hatred of Paul and of libertarianism  and that clearly outweighs the hatred they have for each other. If this was just another Internet clown parading around on YouTube making a fool out of himself, well, that would be one thing. But Vancier is no ordinary clown. He is a follower of the late Rabbi Meir Kahane, whose Kach movement is an officially designated terrorist organization, and Vancier is a convicted terrorist himself. In 1987, he was arrested and charged with masterminding several bombings. He was convicted, along with his co-conspirators (though one committed suicide), and sentenced to 10 years in prison. In this context, Vancier’s declaration that Ron Paul’s supporters deserve to be killed is ominous in the extreme. Bill White! They both have a penchant for stormtrooper-semi-military drag, violent hyperbole, and the sort of hectoring, wide-eyed hysteria and outright viciousness that repels any ordinary human being but attracts fellow miscreants and social rejects. In short, they’re both crazy, and in practically identical ways. But that’s not all they have in common: both hold ideological grudges against Paul and his fellow libertarians. Vancier hates Paul’s foreign policy views, which he sees as a threat to Israel. White, who has attacked libertarians  and myself in particular  resents Paul’s success because the good Dr. No has a non-racist, nonviolent, anti-collectivist explanation and solution for what White and his fellow Nazi nutsos attribute to a nonexistent "Jewish conspiracy"  the Federal Reserve, bank credit expansion, and subsequent waves of bankruptcies and foreclosures. Paul offers his growing audience of politically and often economically disenfranchised voters a rational explanation in the insight of the Austrian economists and the works of Ludwig von Mises, while White and his tiny cadre of National Socialist Workers look to the discredited pages of the Protocols of the Elders of Zion. The Don Black donation brouhaha involves $500 from someone who is a top leader of the Stormfront Web site made under extremely suspicious circumstances. Black’s last known political activities were undertaken on behalf of George W. Bush during the Florida recount, when Black and his fellow racist crazies drove Jesse Jackson off the stage during a Democratic Party rally. The Black contribution was soon discovered by the anti-Paulistas, who demanded that Paul return the "tainted" money  and, presumably, undergo sensitivity training under the aegis of the Southern Poverty Law Center. Paul, however, refuses to return the Black donation, and rightly so: after all, he’s not spending the $500 to advance, say, Holocaust denial or any objectives that could even remotely be connected to neo-Nazism. He’s spending it on promoting his own program of economic freedom, individual liberty, and a non-interventionist foreign policy. Anyway, who put the anti-Paulistas in charge of vetting each and every contribution to the Paul campaign  and why should Ron concede that role to them? Over 70,000 people gave this quarter  is the campaign supposed to comb through each and every one of those names and vet them for political correctness? Naturally, the Paul-haters would answer "Yes"  they’d love to see the campaign consumed with policing itself according to their strictures. What exposes this as a brazen attempt to set up Dr. Paul for a smearing is the publication at Little Green Footballs of photos showing Don Black and his son standing next to Ron  at an event where the candidate was easily accessible to one and all and hundreds of people were in attendance. Anybody could  and did  walk up to the candidate, and, never having met Black to begin with, Paul didn’t know him from Adam. It is ludicrously transparent that Paul is getting a bum rap on this obviously staged incident. 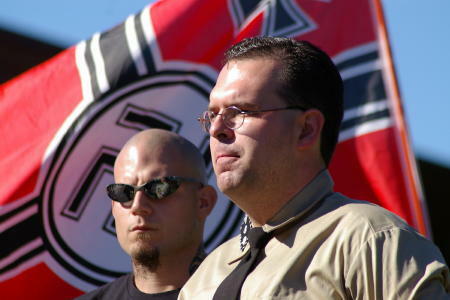 Surely Black, as the leader of a neo-Nazi group, is very well aware that his "support" is hardly welcome and would actually hurt Paul: Stormfront members discussed this openly when "Commander" White posted his statement. For Black to publish those photos on his own site when he knew they would be immediately picked up by the anti-Paul witch-hunters’ brigade  the controversy over his donation was already in progress  pretty much demolishes the idea that he is any kind of Ron Paul "supporter." With supporters like that, Ron doesn’t need any enemies. Essentially, Black did exactly what White did and what professional witch-hunters such as David Neiwert and neocon idiot Michael Medved have tried to do, and that is to smear a good man who doesn’t have a racist bone in his body as a "white supremacist." What’s even more ludicrous is the accusation of "anti-Semitism." Let’s be clear about this: no libertarian, particularly of the Rothbardian variety, of which Paul is one, could possibly entertain the idea of becoming an anti-Semite. In order to do so Paul would have to repudiate his two primary intellectual mentors and guiding lights: Murray Rothbard and Ludwig von Mises, both of whom were Jewish. Indeed, this is what led White to attack Antiwar.com and libertarians in general in a screed that described us as a "Jewish think tank"  because our webmaster and several employees are Jewish. Oh, and I am supposedly "one quarter Jewish," which White should tell my Sicilian grandparents. yes, that’s right, our old "friend" Bill White. Schwartz wrote of "Raimondo’s prominent association with the Russian Jew-baiting website, Pravda.ru, and its American contributor, the neo-Nazi Bill White," but the reality is that there was never any association, prominent or otherwise. Schwartz points to articles by me posted on the Pravda Web site, where White’s diatribes  sometimes attacking me  also appeared. Yet I never gave my permission to Pravda to post my work on their site, and the moment I saw that my columns were appearing next to White’s diatribes, I demanded that Pravda cease and desist, which, to their credit, they did. The point is that, in the case of Ron Paul, the tar-baby method of smearing someone has been used again, with the same tar baby but a different victim. When the "he’s a 9/11 Truther" meme didn’t take, the smear campaign got really down and dirty with the Paul’s-a-Nazi theme. Given Paul’s most un-Nazi-like ideology and demeanor, however, this one isn’t going to fly, either. This has all the marks of a coordinated hit job, and although I wouldn’t venture to guess who’s doing the coordinating, it seems clear to me that the Republican Establishment is frightened to death of an independent run by Paul in the general election  a possibility Paul hasn’t completely ruled out. By marginalizing him now before he cuts into the GOP base, they can save themselves a lot of trouble  and if they have to get in bed with a lot of truly sleazy types, such as Messrs. White and Black, well, then, that’s why they call them "dirty tricks." No bag of tricks, no matter how dirty, is going to be enough to stop the Ron Paul Revolution: his appeal is only increasing, along with his visibility, and smear campaigns like the one exposed above are only going to cause thinking people to wonder what the smear-mongers are so afraid of. What they’re afraid of is that the politics of principle represented by Paul and his followers will finally get a hearing, in the debates and on the campaign trail, on account of the millions of dollars contributed by Paul’s supporters nationwide in a spontaneous and truly phenomenal outpouring of donations and independent activism. The sheer breadth of the anti-Paul Popular Front is an astonishing sight to behold, extending all the way from avowed Nazis to radical Zionists, from Noam Chomsky to Glenn Beck. Both Fox News and the International Socialist Organization are out for Paul’s scalp  and you can tell an awful lot about people by their enemies. What this tells me about Ron Paul is that he’s just what many people on both sides of the political spectrum have been waiting and hoping for.